Our 2013 Workers Unite Film Festival Schedule is Online! After many months of searching out great new worker/labor films and going through the archives of historical labor films, we here at The Second Annual Workers Unite Film Festival have come up with an eight day long program plus an extra evening at one of the biggest unions in NYC, SEIU1199. Our eight day schedule, which you can find on our website under "2013 Schedule" tab, covers many of the themes that effect working people today as the stuggle to make ends meet, or to find a new job, during this very difficult economy. We have films on being fifty and out of work, films about immigrants seeking to find a decent job in their new home - anxious to make a contribution to their new communities. Our films are as close as our own backyard, here in NYC (Cafe Wars and Judith:Portrait of a Street Vendor) to as far away as the men who tear apart de-commissioned oil tankers with their hands and simple tools in the deserts of Pakistan (Iron Slaves). We have films about the African American men who fought for dignity on the job and in their union as steelworkers - one of the most dangerous jobs in America, to mothers in Bangladesh who must put their children with their own parents due to 15 hour days in the sewing factories of high fashion sweatshops. These are the same women who survived a recent "Triangle Shirtwaist" style fire in Bangladesh, where over 111 young women perished because the exit doors to the factory were padlocked shut. One hundred years plus after the deaths at the Triangle Shirtwaist factory in NYC and we are still fighting the exact same battles. Please look through the whole schedule. Find some programs that look intereseting, then go online - by next week - and buy tickets!! We have kept ticket prices as low as possible so as many of you as possible can attend at least one program, or one full day of amazing films. Tickets are $7.50 for one show (online sales may incur a service charge) $11.50 for a full day of films!! And $59.00 for a full 8 days of educational and emotional programming about the lives and struggles of workers and their unions all over the globe. 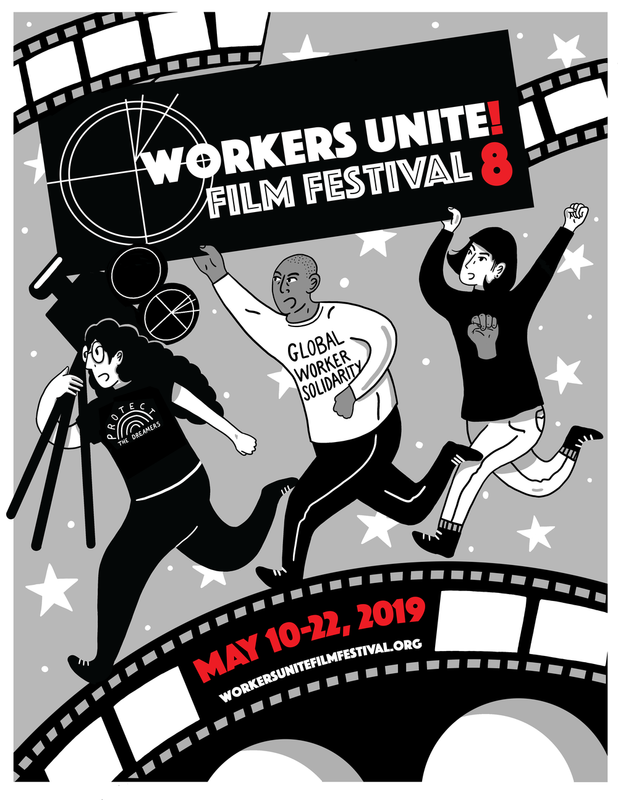 This year we are particularly honored to join with twenty other worker/labor film festivals around the world - known as The Global Labor Film and Video Festival on May 16th. On that day we will screen films on labor issues in China, Pakistan, Mexico, Slovakia, from all over the U.S. and a film about the merchant marines whose work took them from one end of the earth to the other. And that's just one day of the festival! We plan to have either the directors or speakers at most of these events, many of them currently engaged in the worker struggles for labor rights and dignity in the workplace. We want to put these films into context so that we all come out of the theater with both a better understanding of our places in the global fight for labor rights and the motivation to get out their and participate in whatever actions are possible to make these rights a reality. So please take a few minutes to check out the huge list of films and pick out at least a few to come view. If you can afford it, we'd love to have you visit our homepage and make a small donation to help keep building the festival for this year and coming seasons. Apr. 17: Protest at Gap in NYC -- End Sweatshop Death Traps Now! Since 2006, more than 600 garment workers have died in preventable fires while sewing clothing for companies like Gap, H&M, and Walmart. Two years after 29 workers died in a fire at a Gap supplier in Bangladesh, Gap is still refusing to pay for reforms and join with other companies in a binding fire safety agreement that includes worker representation. Until there is real change, any day there could be another factory fire with workers locked inside. JOIN A BANGLADESHI FACTORY FIRE SURVIVOR AND LOCAL ACTIVISTS TO CALL ON THE GAP TO PAY 10 CENTS MORE PER GARMENT TO SAVE WORKERS’ LIVES! SUMI ABEDIN is a Bangladeshi garment worker who survived the November 24, 2012, fire that killed 112 workers at Tazreen Fashions, a factory that supplied Walmart, Disney, Sears, Dickies, and produced US Marines logo apparel for Delta Apparel / Soffe. Sumi was working on the 4th floor of the factory at the time of the fire and survived after jumping from the burning building. KALPONA AKTER is the executive director of the Bangladesh Center for Worker Solidarity (BCWS), one of Bangladesh’s most prominent labor rights advocacy organizations, and is herself a former child garment worker. BCWS is regarded by the international labor rights movement and by multinational apparel companies as among the most effective grassroots labor organizations in the country. Levi Strauss & Co. calls BCWS “a globally respected labor rights organization, which has played a vital role in documenting and working to remedy labor violations in the apparel industry in Bangladesh.” Kalpona is an internationally-recognized labor rights advocate and has traveled widely to speak about the deplorable conditions that Bangladesh garment workers face every day. She was interviewed extensively by local and international media following the deadly fire at Tazreen Fashions in November 2012. This action is sponsored by Corporate Action Network, International Labor Rights Forum, Retail Action Project, SumOfUs, SweatFree Communities, and United Students Against Sweatshops. For more than a decade, Gap, Walmart and other major brands have produced clothes in Bangladesh factories that they know are fire traps. As a result, since 2006, over 600 apparel workers, mostly young women, have died in what could have been preventable factory fires. Now, two major apparel makers—PVH/Tommy Hilfiger and the large German retailer, Tchibo—have signed a legally-binding fire safety agreement that calls for independent fire inspections of all of the Bangladesh factories they use and requires them to pay for the necessary measures to make these factories safe, and to give their workers a say in how to accomplish this. Gap and Walmart have refused to join that agreement and Walmart continues to obstruct efforts to achieve fire safety in the factories it uses in Bangladesh as reported in The New York Times on December 5, 2012 (“Documents Indicate Walmart Blocked Safety Push in Bangladesh”). It’s time for Gap and Walmart to address their history of deadly negligence and take responsibility for workers’ safety before one more avoidable tragedy occurs.